The active bacterial community associated with the gut of Spodoptera littoralis, was determined by stable-isotope-probing (SIP) coupled to pyrosequencing. Using this methodology, identification of the metabolically active bacteria species within the community was done with high resolution and precision. Shao, Y., Arias-Cordero, E. M., Boland, W. Identification of Metabolically Active Bacteria in the Gut of the Generalist Spodoptera littoralis via DNA Stable Isotope Probing Using 13C-Glucose. J. Vis. Exp. (81), e50734, doi:10.3791/50734 (2013). Guts of most insects are inhabited by complex communities of symbiotic nonpathogenic bacteria. Within such microbial communities it is possible to identify commensal or mutualistic bacteria species. The latter ones, have been observed to serve multiple functions to the insect, i.e. helping in insect reproduction1, boosting the immune response2, pheromone production3, as well as nutrition, including the synthesis of essential amino acids4, among others. Due to the importance of these associations, many efforts have been made to characterize the communities down to the individual members. However, most of these efforts were either based on cultivation methods or relied on the generation of 16S rRNA gene fragments which were sequenced for final identification. Unfortunately, these approaches only identified the bacterial species present in the gut and provided no information on the metabolic activity of the microorganisms. To characterize the metabolically active bacterial species in the gut of an insect, we used stable isotope probing (SIP) in vivo employing 13C-glucose as a universal substrate. This is a promising culture-free technique that allows the linkage of microbial phylogenies to their particular metabolic activity. This is possible by tracking stable, isotope labeled atoms from substrates into microbial biomarkers, such as DNA and RNA5. The incorporation of 13C isotopes into DNA increases the density of the labeled DNA compared to the unlabeled (12C) one. In the end, the 13C-labeled DNA or RNA is separated by density-gradient ultracentrifugation from the 12C-unlabeled similar one6. Subsequent molecular analysis of the separated nucleic acid isotopomers provides the connection between metabolic activity and identity of the species. Here, we present the protocol used to characterize the metabolically active bacteria in the gut of a generalist insect (our model system), Spodoptera littoralis (Lepidoptera, Noctuidae). The phylogenetic analysis of the DNA was done using pyrosequencing, which allowed high resolution and precision in the identification of insect gut bacterial community. As main substrate, 13C-labeled glucose was used in the experiments. The substrate was fed to the insects using an artificial diet. Insect-bacterial symbiotic associations are known for a great number of insect species7. In these symbiotic associations, microorganisms play important roles in the growth and development of insects. Microbes have been shown to contribute to insect reproduction1, pheromone biosynthesis3, nutrition, including the synthesis of essential amino acids4, and digestion of inaccessible food to the host. Despite the vast variety of gut-bacterial associations, much less is known about the functional role they play in favor of the insect. Only in case of the termites, the symbiotic digestion of lignocellulose carried out by prokaryotes, protozoa, and fungi, has been widely studied8,9. In contrast to this, little is known about the symbiotic association present in the gut of generalist insects i.e. the cotton leafworm, Spodoptera littoralis. Moreover, due to their frequent shift of plant hosts, generalist insects and their gut associated bacterial communities are permanently exposed to new challenges linked to their feeding habits consuming plants with a plethora of phytochemicals. Beside this, the gut environment in lepidopterans, represents per se a harsh environment for the growth of bacteria because of the high gut pH10. Particularly in the case of S. littoralis, it ranges from 10.5 in the foregut, ca. 9 in the midgut to pH almost 7 in the hindgut11. On the other hand, the bacterial community associated with the gut of S. littoralis is simple. Tang, Freitak, et al.12 reported a maximum of 36 phylotypes belonging to a total of 7 different bacterial species as the only members of the bacterial community associated with this insect. Besides this, no complicated rearing procedure is required for the insect growth in the laboratory. Furthermore, this and the short life cycle of the insect facilitate multi-generational studies, turning this species into an ideal model system for studying gut-microbe interactions. With the advent of PCR-based sequencing technologies, the number of studies dealing with gut biota of several organisms (i.e. humans, insects, or marine organisms) has increased. Moreover, the results are independent from isolation and cultivation of the gut harbored bacteria as in the past. Almost 99% of bacteria are not cultivable and the simulation of the environmental conditions prevailing in the gut is difficult12. By using PCR, 16S rRNA gene fragments (a widely used phylogenetic gene marker among bacteria) could be selectively amplified from a mixed DNA template of gut bacterial communities, sequenced, and cloned. With this information, the user is able to identify the bacterial species after retrieving the sequence information from public databases13,14. Nevertheless, the sequencing approaches to describe bacterial communities remain insufficient due to lack of information on the intrinsic metabolic contribution of the individual species within the community. Stable-isotope probing (SIP) is a promising culture-free technique. It is often used in environmental microbiology to analyze microbial phylogenies linked to particular metabolic activities. This is achieved by tracking stable, isotope labeled atoms from substrates into microbial biomarkers, such as phospholipid-derived fatty acids, DNA, and RNA5. When considering nucleic acids, the methodology is based upon the separation of 13C-labeled DNA or RNA from the unlabeled DNA by density-gradient ultracentrifugation6. Due to this direct connection between the DNA label and metabolic activity, a down­stream molecular analysis of the nucleic acids identifies the species and provides information on metabolic activities. Moreover, combination of DNA-SIP and pyrosequencing as applied by Pilloni, von Netzer, et al.15, permits a particular simple and sensitive identification of the bacterial species present in the heavy 13C-labeled DNA fraction. Up to now, this technique has been applied to describe the bacterial communities involved in biogeochemical processes in the soil under aerobic16,17 and anaerobic conditions18,19. Besides of the use in environmental science, the technique has been applied in medical sciences as reported by Reichardt, et al.5, who described the metabolic activities of different phylogenetic groups of the human intestinal microbiota in response to a nondigestible carbohydrate. Here we use 13C-glucose to 'label' the DNA of the metabolically active bacterial species in the gut. Glucose is a sugar utilized by most bacterial species along the widespread Entner-Doudoroff (ED) pathway, although exceptions are known20. This justifies the use of 13C-glucose as a reliable metabolic probe that provides a link between metabolites of interest and the carbon source along established pathways. Depending on the scientific question, other substrates, i.e. 13C-methane, 13CO2, or plants raised under a 13CO2 atmosphere, can be used to address metabolic activities. At this point, we present the protocol applied in the metabolic characterization of the gut bacterial community of a generalist insect, namely S. littoralis (Lepidoptera, Noctuidae). Moreover, the technique was coupled to pyrosequencing, which in turn allows the identification of insect gut bacterial community with high resolution and precision. As the main substrate, 13C-labeled glucose was utilized during the experiments. Purchase or obtain eggs clutches of Spodoptera littoralis from your own rearing. Maintain them in sterile Petri dishes at room temperature (RT) until hatching. Soak 500 g ground white beans overnight in 100 ml of water. Add 9.0 g ascorbic acid and 75 g agar to 1,000 ml distilled H2O and afterwards boil it. Let the mixture to cool down and when it solidifies (to a white waxy solid mixture) store it at 4 °C until use. Transfer the newly hatched larvae to a clean plastic box and rear them on the artificial diet at 23-25 °C under a long-day regime with 16 hr of illumination and 8 hr of darkness. Change the food every day until the larvae go through all six larval instars. Dissolve 186.1 mg of fully 13C-labeled glucose with distilled and deionized water (ddH2O) and mix it well with 100 g of artificial diet for the SIP experiment. Ensure a final 13C-glucose concentration of 10 mM in the artificial diet. This mimics the in situ glucose concentration in the gut of S. littoralis larvae feeding on cotton plants according to Shao et al. (submitted). Transfer 9-15 healthy second instar larvae from the rearing box to sterile plastic Petri dishes (one larva per Petri dish) containing fresh 13C-glucose spiked artificial diet. Use artificial diet containing the same amount of native glucose (12C-glucose), as described, for feeding the control group. Renew the artificial diet frequently during the incubation period (1 day). Use rearing conditions as in step 1.3. Collect nine larvae from each treatment for later processing (DNA extraction). Each replicate is constituted by three individuals; make at least three replicates per treatment. Clean and disinfect the dissecting tools at the beginning of the work with ethanol 70% (Tools= Vannas scissors, forceps and scalpel with fine disposable blades). Take the insects with a soft forceps and wash their skin superficially with distilled water. Place them on ice for at least 30 min to anesthetize them. While still anesthetized place them at 0 °C for 1 hr to kill them. Disinfect the dead insects superficially by immersing them in ethanol (70%) for a couple of minutes. Perform the insect dissection into a volume of approximately 15 ml of 1x PBS deposited on a sterile Petri dish (1XPBS= 137 mM NaCl, 2.7 mM KCl, 4.3 mM Na2HPO4, 1.47 mM KH2PO4, adjust the pH to 7.4 , autoclave). Be sure of having the whole insect body fully immersed in the solution during the whole dissecting period. Place the insect tissue in a 1.5 ml sterile centrifuge tube and dry all samples at 45 °C in a vacuum concentrator device. Crush dried tissue with a sterile plastic pestle. Extract the genomic DNA using a suitable kit for soil DNA extraction. Transfer the dry tissue to the reaction tube of the kit and follow the instructions as indicated by the manufacturer. Determine the concentration of the final eluted DNA using a spectrophotometer. Set a 50 µl reaction mixture containing 1x Buffer, 1.5 mM MgCl2, 10 mM four deoxynucleoside triphosphates (dNTPs), 2.5 U of Taq DNA Polymerase, 0.5 mM of each primer and 60 ng of the extracted DNA as template. Run the PCR reactions using a thermocycler as follows: initial denaturation at 94 °C for 3 min; followed by 35 cycles: 94 °C for 45 sec, annealing at 55 °C for 30 sec, and extension at 72 °C for 1 min. Use a final extension step at 72 °C for 10 min. Verify the successful PCR amplification in a 1% agarose electrophoresis ethidium bromide (EB) stained gel (dissolve 1 g of agarose in 100 ml of 1x TAE buffer and stain with 1µl EB ). Deposit 5 µl of the PCR product + 1µl of 6x loading dye into the gel pockets. (1x TAE=40 mM Tris-Base, 20 mM glacial acetic acid, 1 mM EDTA, adjust to pH 8). Run the gel using 1xTAE buffer at 300 V, 115 mA for ca. 20 min in an electrophoresis chamber. By using a gel documentation chamber (UV transilluminator connected to a digital camera and computer) observe the gel and compare the size of your final product with the also loaded gene marker; the correct size of the amplicons must be of approximately 1.5 kb. Store the PCR products under deep freezing conditions, preferentially -80 °C, until use. Prepare a 7.163 M cesium chloride (CsCl) solution by gradually dissolving 603.0 g of CsCl in ddH2O and fill up to a final volume of 500 ml. Accurately determine the density of the prepared CsCl solution by weighing a 1.0 ml aliquot on a three digit balance by triplicate. This usually ranges from 1.88 and 1.89 g/ml at RT. Prepare the gradient buffer (100 mM Tris, 100 mM KCl and 1 mM EDTA) by combining 50 ml of 1 M Tris-HCl (pH 8.0), 1 ml of 0.5 M EDTA (pH 8) and 3.75 g of KCl in a final volume of 500 ml using ddH2O. Filter (0.22 µm) sterilize and autoclave this solution. Having determined the individual DNA concentration of the treated insects, measured as in point 4.3, pool those insects corresponding to a replicate together and normalize their DNA concentration to ensure that each one, equally contributes to the pooled sample. A final concentration of 500-5,000 ng of DNA (measure again the final concentration) is suitable for the ultracentrifugation process21. To set up the gradient medium, combine the quantified DNA, gradient buffer and 4.8 ml of 7.163 M CsCl solution together to a mixed volume of 6.0 ml in a sterile 15 ml screw-cap tube (generation of a gradient medium-DNA mixture). Carefully place the prepared gradient medium-DNA mixture into a 5.1 ml ultracentrifuge tube (fill in until the base of the tube neck) using a syringe and needle. Avoid pumping or forming any air bubbles. Include at least one blank gradient (using ddH2O instead of DNA) in each centrifuge run as a reference gradient. Balance tube pairs to within 10 mg of weight after each required gradient medium is filled into the respective ultracentrifuge tube. Seal the tube with a "Tube Topper" and ensure that the seal is leak-free by inverting the tube and applying moderate pressure by hand. Use a near vertical rotor with eight wells for holding 5.1 ml ultracentrifugation tubes for the ultracentrifugation. Carefully seal the rotor wells and load the rotor into the ultracentrifuge according to the manufacturer's instructions. Set the ultracentrifugation conditions: spin at 50,000 rpm (around 177,000 x g), temperature at 20 °C, and ultracentrifugation running time for 40 hr with vacuum. Select maximum acceleration and the deceleration without brake. Once finished, carefully remove the tubes from the centrifuge rotor using forceps. Place them in a rack without disturbing the formed gradients within the tubes. Process the gradient fractionation samples as soon as possible to minimize any diffusion. Use an accurate HPLC pump system to carry out the gradient fractionation, which equally separates the formed gradients from the ultracentrifuge tube top displacement method. Connect the HPLC pump (100% flow gradient) to the bottle filled with 1 L displacement ddH2O and tightly attach to the open pump tubing with a 23 G 1 in syringe needle. Add sufficient bromophenol blue dye to the ddH2O to give it a dark blue color. This facilitates the visualization of the interface between the gradient medium and the displacement of ddH2O. Set the pump to a flow rate of 850 µl/min and equilibrate the system until a single drop of the blue-colored ddH2O emerges out of the syringe needle. Carefully fix the ultracentrifuge tube to a clamp stand and pierce the bottom of the tube with a syringe 23 G 1 in long needle. Connect the pump to the ultracentrifuge tube by inserting the needle attached to the pump tubing into the top of the tube, and collect drops from the bottom directly into sterile 1.5 ml microcentrifuge tubes. Collect a fraction every 30 sec, amounting to approximately 425 µl per fraction and a total of 12 fractions per gradient. Note that the last fraction (fraction 12) usually contains the displacement ddH2O and should be discarded. After fractionation, measure the density of all separated fractions using an analytical balance as mentioned in step 5.1.2. Precipitate the DNA from each fraction (around 425 µl) by first adding 1 µl glycogen (20 µg/µl in ddH2O, autoclaved) as a carrier for the precipitation of low amount of DNA. Mix it well by inversion. Add two volumes (850 µl) of polyethylene glycol (PEG) solution (dissolve 150 g of polyethylene glycol 6000 and 46.8 g of NaCl in ddH2O to a total volume of 500 ml. Filter, sterilize and autoclave. The PEG solution is 30% PEG 6000 and 1.6 M NaCl), and mix again by inverting ten times. Leave the tubes at RT for at least two hours (if necessary, overnight) to precipitate the DNA. Centrifuge the precipitates at 13,000 x g for 30 min at RT. A visible pellet should form. Carefully remove the supernatant with a pipette and wash the pellet with 500 µl of 70% ethanol. Centrifuge under the same conditions for 10 min again. Carefully discard the supernatant and air-dry the pellet at RT for 15 min. Redissolve the dried DNA pellet in 30 µl of ddH2O and mix well by gently tapping the tube. Quantify the DNA in each gradient fraction as in step 4.3 Store the samples under -20 or -80 °C if long term storage is required. Ensure that the unlabeled native (12C) DNA occupies the density range from 1.705 g/ml to 1.720 g/ml, whereas 13C-labeled DNA has a density of around 1.720-1.735 g/ml. Note that both the native and 13C-labeled DNA extracted from environmental samples can span several gradient fractions. Expect the light DNA to be associated with fractions 9-11 and the heavy DNA to be associated with fractions 4-6. Combine key fractions to create a single "compiled" representative fraction according to the specific peak allocation of the density-resolved DNA. Alternatively, other means to examine the separated fractions by using the isotopic ratio mass spectrometry (IRMS)22 or a fingerprinting method, such as denaturing gradient gel electrophoresis (DGGE)23, can help to choose appropriate fractions before the sequencing. Perform amplicon pyrosequencing using a Roche 454 FLX instrument with Titanium reagents. Prepare barcoded amplicons for multiplexing using the fusion primer set Gray28F (5- GAGTTTGATCNTGGCTCAG -3) and Gray519r (5- GTNTTACNGCGGCKGCTG -3)24,25 extended with the respective primer Adaptor A/B and sample-specific multiplex identifiers (MID). Apply a one-step PCR with 30 cycles, using a Hot Start Taq polymerase, to generate the sequencing library. Sequence the amplicons based upon the supplier protocol, and extend the reads from the forward direction (Gray28F) as described in http://www.researchandtesting.com/. Initially, convert the 454-machine-generated sff file to FASTA, QUAL and Flowgram files with the process_sff.py script. Validate the mapping file (based on check_id_map.py) and assign multiplexed reads to biological samples with the split_libraries.py script. Trim the low-quality ends with a sliding window size of 50 and an average quality cutoff parameter of 25, eliminate also short ambiguous sequences (the length <200 bp) from the dataset. Denoise the 454 data using the denoise_wrapper.py. Next, cluster the high-quality reads into operational taxonomic units (OTUs) using the multiple OTU picking method (pick_otus.py with 97% sequence similarity cut-offs). Pick a representative sequence from each OTU using pick_rep_set.py. Assign taxonomy to the representative sequence set based on assign_taxonomy.py. Use the Ribosomal Database Project (RDP) classifier with a minimum confidence to record assignment set to 0.80. Align the representative sequence set against the prealigned Greengenes core 16S sequences using the algorithm PyNast (align_seqs.py with the minimum sequence identity percent set to 75). Additionally, deplete chimeras from further analysis by running identify_chimeric_seqs.py. Remove all gap positions (not useful for phylogenetic inference) with the lanemask template (filter_alignment.py) prior to building a phylogenetic tree (make_phylogeny.py). Finally, generate OTU tables with make_otu_table.py, describing the occurrence of bacterial phylotypes within each sample. Use the OTU table to construct the heatmap for comparing the bacterial abundance and activity. If required, compute the alpha and beta diversity within and between samples, respectively. In the same manner, rarefaction curves (graphs of diversity versus sequencing depth) and Principal Coordinates Analysis (PCoA) plots representing the relationships among microbial communities can be also prepared. To achieve sufficient labeling of the metabolically active bacteria present in the insect gut, the insect must be exposed to the 13C-rich substrate for a previously optimized period sufficient to allow the separation of the labeled heavier fraction easily from the unlabeled lighter one. In our case, 13C-glucose was supplemented in the artificial diet at a final concentration of 10 mM for 1 day (Figure 1A). The same amount of normal glucose (Figure 1B) was supplied in the artificial diet of the control insects. As mentioned before, separation of the DNA fractions (heavier from lighter) is the basis of the whole process. Therefore, the first step to be performed is the extraction of DNA from the tissue of interest; in this case, the bacterial community associated with the insect gut. To confirm its quality it is important to run an electrophoresis gel to determine if any DNA at all was obtained from the analyzed tissue. In Figure 1C, it is observable a strong band of genomic DNA at the top of the image confirming the positive DNA extraction. In addition, it is necessary to perform a diagnostic PCR, using bacterial universal primers, to determine the presence of bacterial DNA (Figure 1D). This positive result is important to decide if further continue with the separation of the extracted metagenomic DNA. After ultracentrifugation, once the quantity of the DNA in each separated fraction is confirmed, and the measurement of the density is done, plot the average fraction density in g/ml over fraction number to confirm the proper gradient formation in tubes, which normally covers a density range from 1.690 g/ml (for fraction 12 or 11) to 1.760 g/ml (for fraction 1). Quantitative pyrosequencing is performed directly on the representative SIP gradients to reveal species lineage and relative abundance (Figure 2). Here we sequenced the heavy fractions from both the 13C-glucose amended sample and the unlabeled control, which served for profiling active populations in the community. After sequencing, a total of 120,045 high quality reads with an average length of 404 nucleotides were generated. 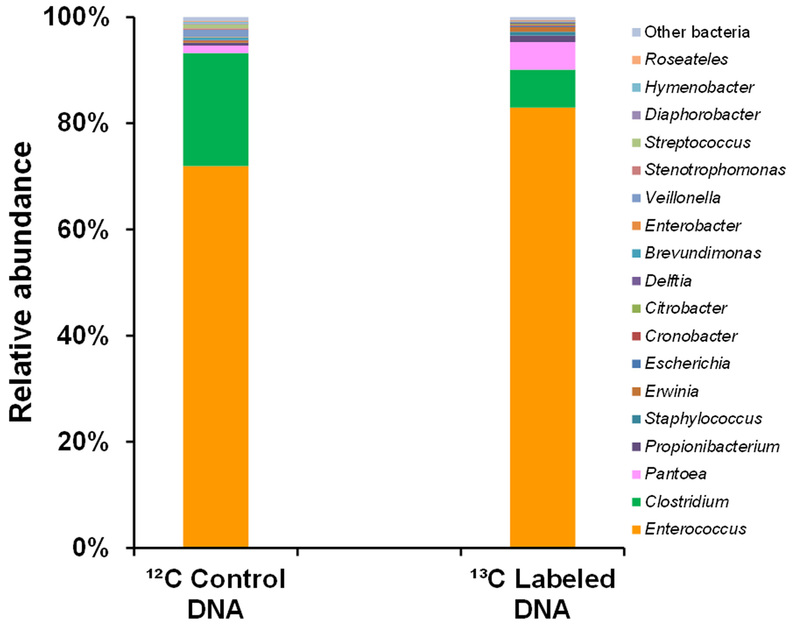 The pyrosequencing profile showed an increased abundance of certain species including Enterococcus and Pantoea in the labeled sample (13C-labeled DNA, Figure 3) compared with that in the control group (12C Control DNA, Figure 3). Therefore those bacteria are considered to be metabolically active, and merit further study. Figure 1. 13C-glucose feeding experiment, DNA extraction and PCR amplification of the bacterial 16S rRNA gene. (A) 13C-glucose amended artificial diet consumed by Spodoptera littoralis larvae. (B) Native glucose (12C-glucose) amended artificial diet consumed by larvae from the same batch of insects used in (A), which serves as the control. (C) Typical metagenomic DNA extract from the gut tissue of larvae in the 13C-glucose treatment group and in the 12C-glucose control group. Three biological replicates (lane 1, 2 and 3) are included in each group. M stands for 1 kb DNA marker. (D) PCR amplification with a universal bacterial primer set generates the correct 1.5 kb 16S rRNA gene products by using the extracted metagenomic DNA as the template. Lanes 1 is the PCR positive control. Lane 2 and 3 represent the 13C-glucose treated sample and the 12C-glucose control, respectively. Click here to view larger image. Figure 2. Outline of a Pyro-SIP experiment involving CsCl density gradient ultracentrifugation and fraction characterization with pyrosequencing of the separated DNA. H= higher abundance, L= lower abundance. Click here to view larger image. Figure 3. Bacterial diversity and relative abundance in the heavy fractions of the native glucose fed larvae (12C-control DNA) and 13C-glucose fed larvae (13C-labeled DNA). Click here to view larger image. The gut of most insects harbors a rich and complex microbial community; typically 107-109 prokaryotic cells lodge there, outnumbering the host's own cells in most cases. Thus, the insect gut is a "hot spot" for diverse microbial activities, representing multiple aspects of microbial relationships, from pathogenesis to obligate mutualism27. Although many studies have described an amazing variety of insect gut microbial communities, characterization of the metabolic activity of gut microbiota is rare. Stable isotope probing approaches offer now a possibility for distinguishing the active members from a complex microbiota background independent of cultivation and even in vivo. We applied this valuable tool to study the gut microbiota in an insect model system, cotton leaf worm (Spodoptera littoralis). 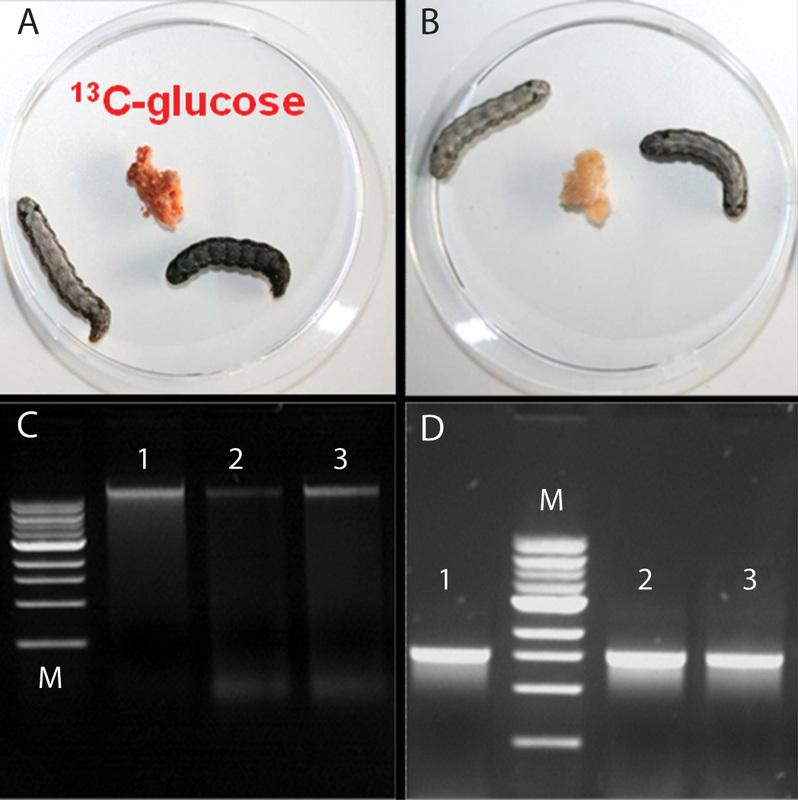 Since glucose is the dominant sugar in the gut of cotton leafworm, in this demonstration we fed the larvae with an artificial diet spiked with an extra but physiological dose of 13C-glucose to track the metabolically active bacteria in the gut flora. An identical incubation established with native glucose provided a critical control for subsequent comparison to ensure that any apparent labeling of nucleic acid was not an artifact of the method itself, such as high G+C content in DNA contributing to separation. The near in situ concentration of glucose additionally reduced experimental bias. Other considerations related to a rigorous experimental setup of the DNA-SIP study has been discussed elsewhere28,29. The gut bacteria normally are metabolically highly active and have short generation time compared to the microorganisms from most terrestrial and aquatic environments. Thus a 24 hr continuously feeding caused already a significant labeling. Note that a large amount of host genomic DNA was also coextracted from the gut tissues, which should be taking into consideration when discussing the results. The typical gradient fraction characterization relies on the low-resolution fingerprinting methods, such as terminal restriction fragment length polymorphism (T-RFLP), and time consuming clone library construction to link the data. It is only recently that the advent of high-throughput second generation sequencing technique allows for rapid, cost-effective, and detailed analysis of complex microbial communities. Here we applied this new technology to directly survey the genetic composition of density gradient fractions and identify metabolically active bacteria, which gave enhanced sensitivity compared with the gel electrophoresis-based methods, and facilitated subsequent phylogenic classification. By comparing equivalent heavy fractions from both the 13C-labeled and 12C-control samples, we find that Pantoea and Enterococcus became labeled upon isotope probing. Once the metabolically active bacteria have been identified, other analysis such as the fluorescence in situ hybridization (FISH) using specific probes and metagenomic analysis of the labeled DNA recovered from active community members can be conducted to provide a comprehensive insight into the true symbionts associated with the host. Based on the established system here, other 13C-labeled carbon sources could also be fed into the host to dissect the bacteria involved in the targeted gut metabolic pathway, for instance, labeling the cellulose to identify active bacteria involved in the host digestion process. With the development of such new approaches, the role of insect gut microbiota will become more apparent than currently. Collectively, the protocol described here represents a straightforward, rapid, and effective method for determining metabolic activities of the gut microbiota, which further could be applied to assess the specific role of bacterial symbionts in the host nutrition, detoxification, and defense. We thank Angelika Berg for laboratory assistance. This work was supported and financed by the Max Planck Society and the Jena School for Microbial Communication (JSMC). Pais, R., Lohs, C., Wu, Y. N., Wang, J. W., Aksoy, S. The obligate mutualist Wigglesworthia glossinidia influences reproduction, digestion, and immunity processes of its host, the tsetse fly. Appl. Environ. Microbiol. 74, 5965-5974 (2008). Freitak, D., Heckel, D. G., Vogel, H. Dietary-dependent trans-generational immune priming in an insect herbivore. Proc. Biol. Sci. 276, 2617-2624 (2009). Dillon, R. J., Vennard, C. T., Charnley, A. K. A Note: Gut bacteria produce components of a locust cohesion pheromone. J. Appl. Microbiol. 92, 759-763 (2002). Douglas, A. E. Nutritional interactions in insect-microbial symbioses: Aphids and their symbiotic bacteria Buchnera. Annu. Rev. Entomol. 43, 17-37 (1998). Reichardt, N., Barclay, A. R., Weaver, L. T., Morrison, D. J. Use of stable isotopes to measure the metabolic activity of the human intestinal microbiota. Appl. Environ. Microbiol. 77, 8009-8014 (2011). Dumont, M. G., Murrell, J. C. Stable isotope probing - linking microbial identity to function. Nat. Rev. Microbiol. 3, 499-504 (2005). Gil, R., Latorre, A., Moya, A. Bacterial endosymbionts of insects: insights from comparative genomics. Environ. Microbiol. 6, 1109-1122 (2004). Brune, A. Encyclopedia of Insects. VH, R. esh, Cardé, R. T. Elsevier. 1132 (2005). Breznak, J. A., Brune, A. Role of microorganisms in the digestion of lignocellulose by termites. Annu. Rev. Entomol. 39, 453-487 (1994). Broderick, N. A., Raffa, K. F., Goodman, R. M., Handelsman, J. Census of the bacterial community of the gypsy moth larval midgut by using culturing and culture-independent methods. Appl. Environ. Microbiol. 70, 293-300 (2004). Funke, M., et al. Rapid hydrolysis of quorum-sensing molecules in the gut of lepidopteran larvae. Chembiochem. 9, 1953-1959 (2008). Tang, X. S., et al. Complexity and variability of gut commensal microbiota in polyphagous lepidopteran larvae. PloS One. 7, (2012). Amann, R. I., Ludwig, W., Schleifer, K. H. Phylogenetic identification and in-situ detection of individual microbial-cells without cultivation. Microbiol. Rev. 59, 143-169 (1995). Olsen, G. J., Lane, D. J., Giovannoni, S. J., Pace, N. R., Stahl, D. A. Microbial ecology and evolution - a ribosomal-rna approach. Annu. Rev. Microbiol. 40, 337-365 (1986). Pilloni, G., von Netzer, F., Engel, M., Lueders, T. Electron acceptor-dependent identification of key anaerobic toluene degraders at a tar-oil-contaminated aquifer by Pyro-SIP. FEMS Microbiol. Ecol. 78, 165-175 (2011). Lu, Y. H., Conrad, R. In situ stable isotope probing of methanogenic archaea in the rice rhizosphere. Science. 309, 1088-1090 (2005). Radajewski, S., Ineson, P., Parekh, N. R., Murrell, J. C. Stable-isotope probing as a tool in microbial ecology. Nature. 403, 646-649 (2000). Lueders, T., Pommerenke, B., Friedrich, M. W. Stable-isotope probing of microorganisms thriving at thermodynamic limits: Syntrophic propionate oxidation in flooded soil. Appl. Environ. Microbiol. 70, 5778-5786 (2004). Kunapuli, U., Lueders, T., Meckenstock, R. U. The use of stable isotope probing to identify key iron-reducing microorganisms involved in anaerobic benzene degradation. ISME J. 1, 643-653 (2007). Fuhrer, T., Fischer, E., Sauer, U. Experimental identification and quantification of glucose metabolism in seven bacterial species. J. Bacteriol. 187, 1581-1590 (2005). Dunford, E. A., Neufeld, J. D. DNA Stable-Isotope Probing (DNA-SIP). J. Vis. Exp. (42), (2010). Yamasaki, S., Nomura, N., Nakajima, T., Uchiyama, H. Cultivation-independent identification of candidate dehalorespiring bacteria in tetrachloroethylene degradation. Environ. Sci. Technol. 46, 7709-7716 (2012). Lueders, T., Manefield, M., Friedrich, M. W. Enhanced sensitivity of DNA- and rRNA-based stable isotope probing by fractionation and quantitative analysis of isopycnic centrifugation gradients. Environ. Microbiol. 6, 73-78 (2004). Ishak, H. D., et al. Bacterial diversity in Solenopsis invicta and Solenopsis geminata ant colonies characterized by 16S amplicon 454 pyrosequencing. Microb. Ecol. 61, 821-831 (2011). Sun, Y., Wolcott, R. D., Dowd, S. E. Tag-encoded FLX amplicon pyrosequencing for the elucidation of microbial and functional gene diversity in any environment. Methods Mol. Biol. 733, 129-141 (2011). Kuczynski, J., et al. Using QIIME to Analyze 16S rRNA Gene sequences from microbial communities. Curr. Protoc. Microbiol. Chapter 1, Unit1E 5 (2012). Dillon, R. J., Dillon, V. M. The gut bacteria of insects: nonpathogenic interactions. Annu. Rev. Entomol. 49, 71-92 (2004). Neufeld, J. D., et al. DNA stable-isotope probing. Nat. Protoc. 2, 860-866 (2007).